If you're thinking of exchanging your boots please review our EXCHANGE POLICIES. Thank you. Footwear product (boots) must NOT show any evidence of wear or damage; scuffing on the leather upper or bottom of outsole due to use on or around abrasive materials and/or surfaces. 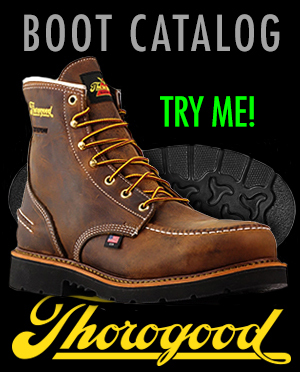 Please inspect your boots carefully - your returned footwear product must appear new - scratches, cuts, dents to the leather upper, including dirt, dust, asphalt on any part of the footwear product is considered "wear or damage" by our definition. damage" is 85% of the original footwear product cost to the customer. Footwear product returned with "wear or damage" cannot be returned to the factory as new product, and therefore, is resold as pre-worn or used merchandise. Return shipping costs are the responsibility of the customer. We recommend USPS Parcel Post for economy and service. You are not required to express ship your return. Customers will be reimbursed for the purchase price of the boots minus a $3 restocking fee and the original $5 handling fee for each pair returned. Also, any customer-requested express shipping costs (if applicable) are non-refundable. For customers making "Perfect Fit Option" returns, the original service charge for the Perfect Fit option and the original $5 handling fee are non-refundable. Also, any customer-requested express shipping costs (if applicable) are non-refundable. any tracking numbers provided by the shipper for reference purposes. Shipping costs associated with returned items are the responsibility of the customer, EXCEPT when TheUnionBootPro shipped an incorrect footwear item related to your original order OR the footwear item ordered has a recognized manufacturing defect.